DAVIE, Fla. – November 5, 2018 – Dental Fix Rx, a fast-growing national mobile dental equipment repair franchise, presented Wisconsin-based franchisee Robert Pabelick with the brand’s 2018 Franchisee of the Year award. Pabelick came to Dental Fix Rx without any previous business ownership experience, yet managed to build a client base of more than 200 regular customers in just two years. Pabelick opened his Dental Fix Rx business in April 2016, after working for 20 years as a manufacturing engineer and manager. His territories span the Milwaukee and Waukesha, Wis. regions, and he has already acquired hundreds of customers and counting. Since his first year, Robert doubled his client base and continues to add new customers each month. 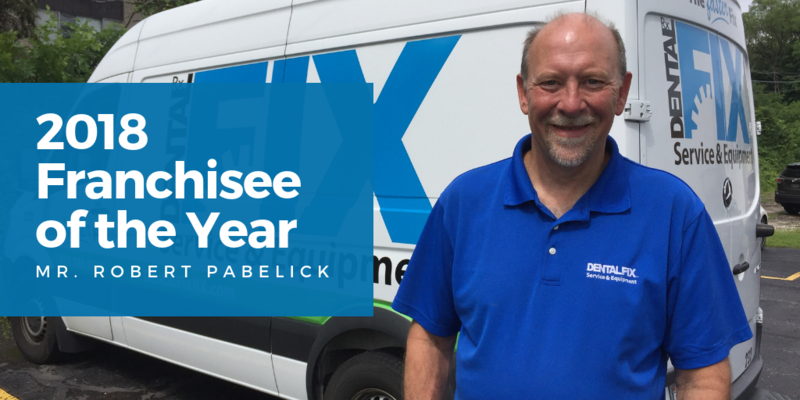 His positive attitude, commitment to the Dental Fix Rx brand and dedication to premier customer service were just some of the factors behind the leadership team’s decision to present the award to Pabelick. Aside from his own lead generation and business growth efforts, Pabelick credits much of his success to Dental Fix Rx’s comprehensive training and support programs. In 2017, Dental Fix Rx was once again ranked on Inc. magazine’s prestigious 5000 Fastest Growing List, being recognized for its financial strength and stability, exceptional growth rate and size of franchise system. Dental Fix Rx was again named one of the Top U.S.-Based Franchises by Franchise Times in 2018. Noted as the most respected ranking in franchising, the Franchise Times Top 200+ measures franchise companies by year-end global sales across all company and franchised units. In addition to Dental Fix Rx’s position as an industry leader, much of the credit for the franchise’s success is owed to its intensive nine-week training program. Franchise owners receive all the tools and training necessary to perform a variety of repairs on dental equipment – from handpieces to chairs and vacuum pumps – so no prior industry experience is necessary.